More kits on the go! Fully assembled, tested machine, the same version as the one I’ve just been shipping. Just add a flat surface, a computer, pens and paper. £170 delivered to the UK, more elsewhere. Parts only. Including sprockets, motors, motorshield, gondola parts and bracket parts. Does not include arduino, cables, connectors, power supply. For the tinkerers amongst us who already have a stock of wires and microcontrollers, and don’t mind soldering and things. £80 delivered in the UK, more elsewhere. 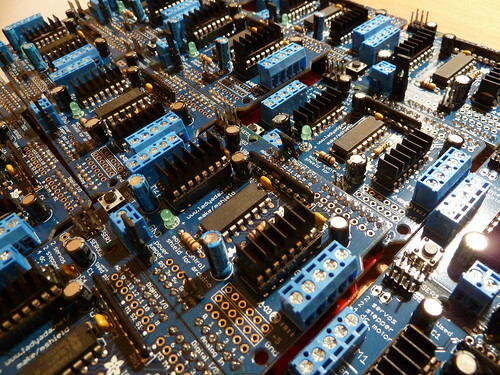 In the interests of transparency, I’ll let you know that I’m planning on something like a crowdfunding campaign to develop a machine with a custom PCB. This is likely to be around the same cost as the fully assembled machine above, but will have a more automated calibration, and most importantly, will be able to run standalone, retrieving it’s information from an SD card. This stuff will not be ready for months, so if you’re interested in something new, keep your eyes open for that in the next couple of weeks. It’s a complete guess, but I’d hope to be shipping this next gen machine in February or March 2012. Please get in touch if you’re interested in this. I will be open for v1 kits for a couple of weeks, and get in touch with all the people who have contacted me about kits since closing to give them first dibs on this batch. A batch of 16 or 20 is about the best I can hope to do I think, so it’ll be closed when that get reached – when they’re gone they’re gone! 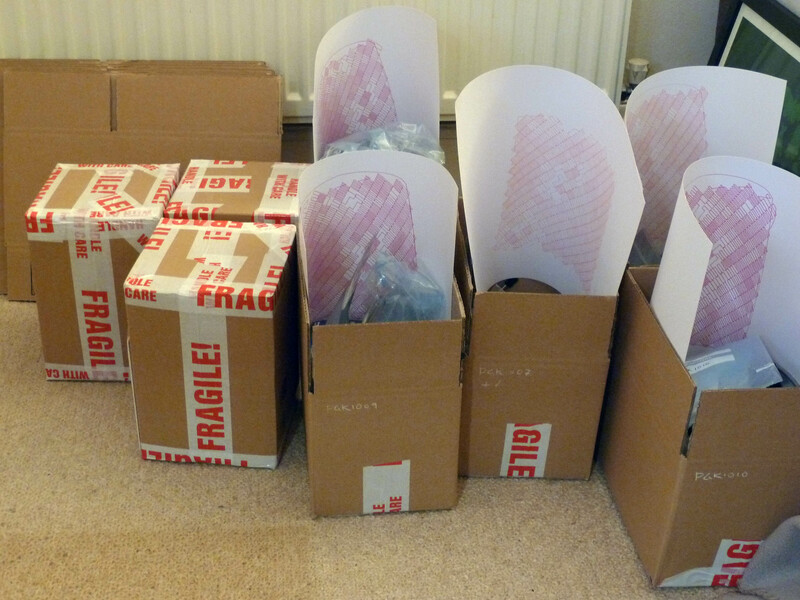 The first round of polargraph machines is all done, assembled, tested, packed and on their way to the first 16 buyers! I know 16 doesn’t sound like much, but compared to 1 it’s loads, and was quite hard work to fit it around a regular job, a wife, and in a rather bijou flat. My kingdom for a shed. Still, I have been lucky, and nothing went very wrong, but everything I did took longer than I expected it to – probably around 16 times longer. Thank you to the first buyers, I am on hand to help you if you need me and I would love to hear/see what you get up to with your machine. The first couple of polargraph machines are on their way! I have had a little factory set up, and am testing each machine with a drawing. 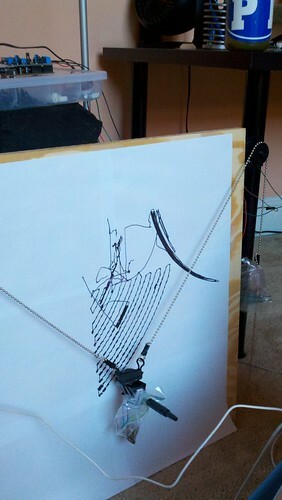 So each will ship with its first drawing. I AM PLEASED. Also slightly updated the instructions. I’m very excited because I got the last of my parts through last night. I need to do a quick test to see if the new string really is the disaster I was hoping it wasn’t, and if it is, write a fix for it, but other than that, I’m going to get my test on, and then get my pack and post on! I will email folk individually to let them know their machine is on the way. Or rather, still delays – they’re the same ones. I’ve got all of the difficult stuff finished last week, all the wiring and things. Am waiting on a package of 100m of beaded cord that should’ve been here already and some power connectors that also should’ve been here already. So frustrating – it was going so well! Big apologies to everyone who was expecting their kit shortly. I will keep you all updated. Hello, well I’ve just discovered that the new batch of beaded cord I have has a slightly different pitch than the old batch. This means that the distance per revolution will be different. I am expecting a whole lot of this new stuff (expecting it days ago actually), so I am probably going to switch to this pitch entirely. In other news, I can report that I am almost finished making up cables for the motors. But that I’d underestimated (again) how long it takes to make the breakout boards for the motorshields, so that’s still to break the back of. 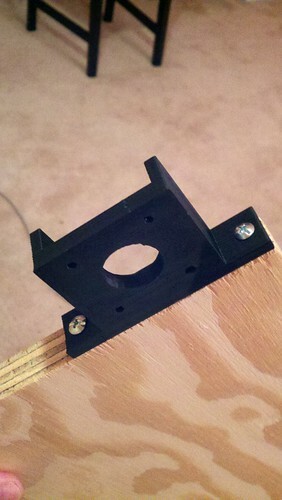 And, as I say, this beaded cord is missing en route anyway, so maybe my hopes about shipping kits tomorrow was folly. Disappointed. 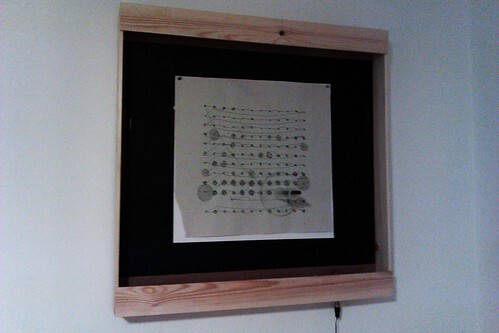 Matt Venn has got a drawing machine that is rigged as an energy monitor, it looks neat, is in a nice case and works. Click on this image to see some more. He has also designed and made all the gear that drives it, it’s an excellent project, and he’s a good guy to talk to about it too. A continuous monitor of some sort was exactly the kind of thing that I wanted to do with the machine when I started, so I’m excited by seeing this project, and I think my current polargraph software kit is probably open enough to be used for this kind of thing too. 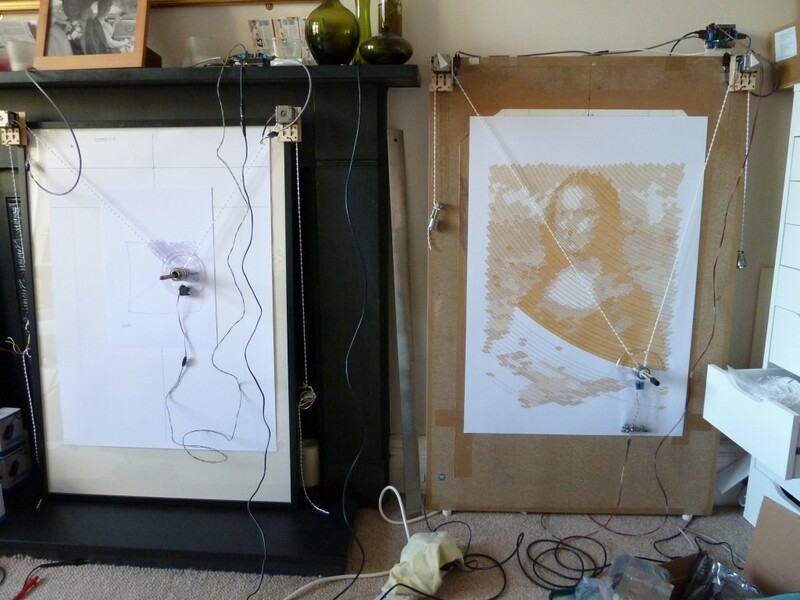 John Abella‘s made this cracking drawbot running polargraph software – brilliant and incredibly gratifying to see that I’ve done something that other folks can use, using parts printed on a makerbot. He says he’ll be releasing the part models at some point too. Also very envious of the ability to 3d print stuff on demand, and extra excited because I’ve got one of them repraps coming soon. SOON! I made this PDF which I will include in the kit – a simple guide on setting up the Polargraph. This does not cover using the software really, since that’s another kettle of fish, but it’s about the physical stuff. It will become slightly more illustrated in the future. Have a look at it at Simple setup guide.